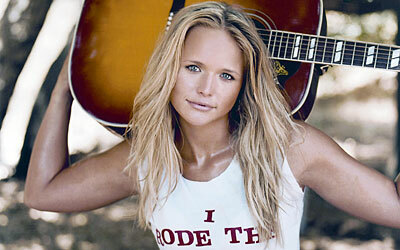 Vocalist Miranda Lambert's Kerosene, her first release, is number one on the country charts. "When my manager called with the news I was driving home from the gym and I had to tell him to hang on because my truck had just died," laughed Miranda. "I had to pull over to the side of the road - I'd like to say it was just because of the shock I was feeling, but my truck really wouldn't start. It's an old beat up Ford and it's always doing that but it picked the perfect moment." "Of course the first thing I did when I got home was call my band and they all started crying, added Miranda. "This weekend we're doing a show in Gulfport at a Casino so we'll leave the celebration to your imagination." "A Number One debut for a new artist is a major feat and is a testament to Miranda's solid talent as a singer, songwriter and performer. All of us at Epic are extremely proud of Miranda," said Mark Wright of Sony Music Nashville. In addition to the sales success, Miranda is also receiving widespread critical acclaim. The news of her Number One debut comes on the heels of a sweeping media blitz. She'll be the focus of large upcoming features. Miranda wrote or co-wrote eleven of the twelve tracks on Kerosene including the first single, "Me and Charlie Talking" which was a top-twenty-five radio hit and has been the Number One song on the Texas Music Charts for the last eleven consecutive weeks - tying Gretchen Wilson's Redneck Woman.